One of the things that makes my figures unique is the fact that each has to be hand-crafted. Although there is a positive side to that - you get great variance in your forces - the negative is that everything takes longer to make. Some things you would just prefer not to have to make over and over again, especially if they are tedious to make, or particularly small. There is a new product out there for making press molds called Instant Mold. Here is a video showing you some ideas for its use, and how easy it purports to be. I just ordered a couple of packages of Instant Mold (you can find it a little cheaper on eBay), so expect to see a future blog entry on how I will use them. Granted, the pieces I make won't be wood, but that has been true in the past. I will probably use Green Stuff to make weapons, cartridge boxes, shield bosses and decorations, and maybe even hats and helmets, which have always been my biggest irritation. I don't think I will be doing rifles or muskets, however, as I like the look that flat toothpicks provide, and they are very easy to make and paint. 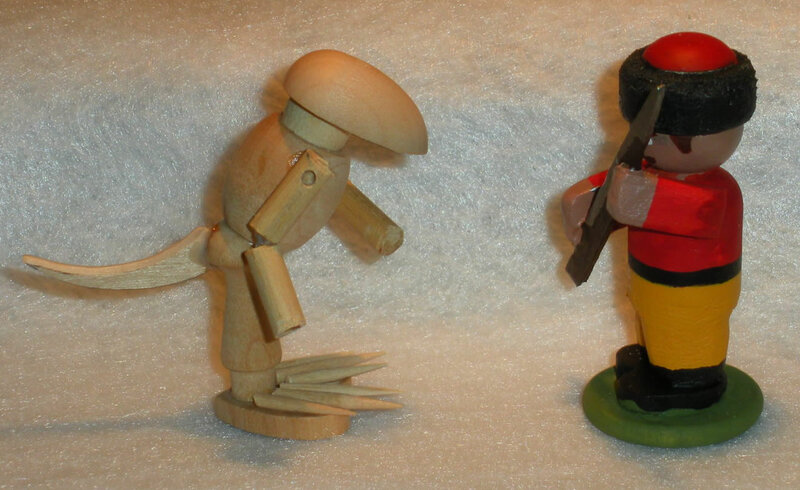 It is interesting looking back over the blog, and the original plans I had for my wooden warriors. Back then, the game Command and Colors: Napoleonics was due in six months or so and I wanted to build Napoleonic soldiers for the game. I figured about four figures per unit and about 12 infantry, 6 cavalry, and 3 artillery per side, so about 142 figures or so, depending upon unit makeup. After doing a unit of French infantry, I started thinking about the old Column, Line, and Square games I had played as a kid, and how impressive it looked with all those miniatures. How much more would it be with 42mm figures? Of course, a small command was about 165 figures, so that would be about 330 figures, so the requirements were growing rapidly in my imagination. The unit pictured above, is only 2/3rds of a single battalion (24 figures), so I had a long way to go. 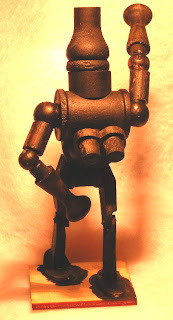 As I started making more figures, I found that I received most pleasure out of making them, painting them, and gaming with them, in that order. Yes, believe it or not, gaming was last! I am one of those guys that takes pleasure out of "creation", and finds it relaxing, so I spent more time "experimenting" and individualizing the figures than in "grinding them out". The problem was, my goal was to grind them out, so it became less and less enjoyable making and painting them, which caused me to set them aside. It is only recently that I realized the true problem, that my goal was unrealistic – at least in the short term (i.e. anything measured in less than years) – so by changing my goal, I found I could get back into this part of my hobby. For the more "mass produced" stuff I will probably continue building 28mm armies, using the same techniques as Matt Kirkhart and John Acar (tip of the hat to these two), but for DBA. So, hopefully you will see more soon. Although the troglodyte is not finished, it is close. I am still trying to figure out a few things, mostly where to add details that will be seen, as opposed to adding detail for detail's sake. For example, the scaly 'eyebrows' work, but all of the scales should have the dark green behind it to make it 'pop'. I definitely need to add some nostrils to the snout too. Maybe an alligator-style set of nostrils rather than a slit, like a lizard's. I will have to check the source miniatures. The tortoise shell shield turned out pretty well for hand drawing and three colors. The beady yellow eyes look funny, but the source material mentions several times that the troglodytes always look 'surprised'. The eye popping look does that, especially when the creature has no eyelids. I think the spine and scales turned out well. Need to put dark green around the 'spurs' on the back of the legs to make that pop. 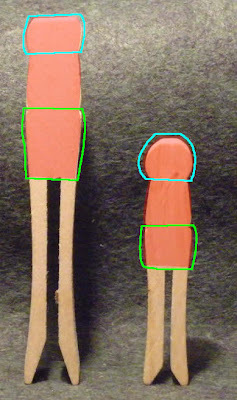 Same for the scale on the knees. Most missing is the stone head for the spear. Not sure what I want to use to make that yet. As it turns out, I have a number of seeds that just might fit the bill. I think the mouth and teeth also turned out well. It gives a 2.5D appearance by overlapping the teeth and the upper jaw. I might have another photo of the finished troglodyte later, but I am working on 11 more of these, using a slightly different set of parts (primarily redoing the legs), so that is probably when the next snap of this will appear. 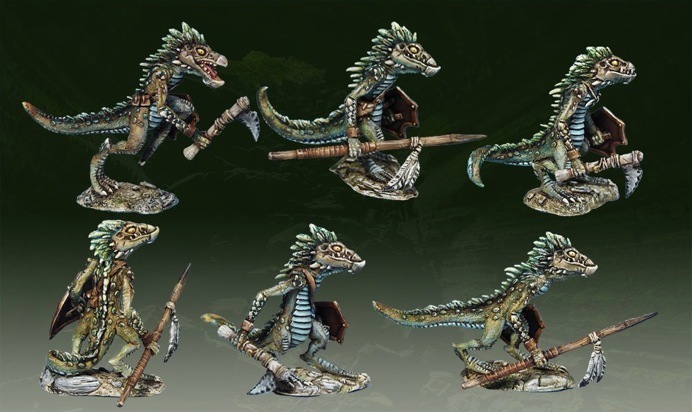 Recently I have been reading the Shadowsea rules and campaign material and I thought it might be fun to make a lizardman-like creature – named a Troglodyte – from that genre. The basic idea is to get the shape of the figure first, then worry about how to model all of the little details, either in wood, some other material, or simply with paint. As shown in the pictures above, the figure is not completed, as it has no fingers, weapon, shield, and other little embellishments, like a lizard's crest. 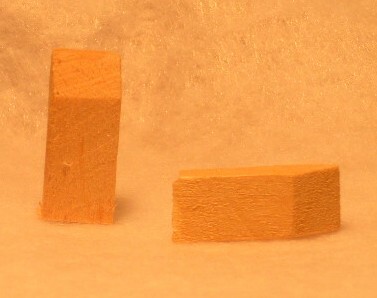 The picture below shows the basic shapes that make up the figure. Blue - the head is a split egg. Red - the neck is a flat head plug. Yellow - the body is a barrel bead. 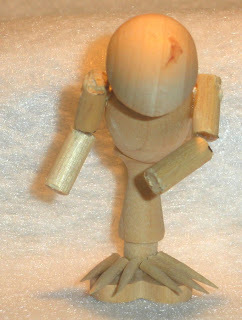 Green - the segments of the arm are simple round dowels, connected with sewing pins. 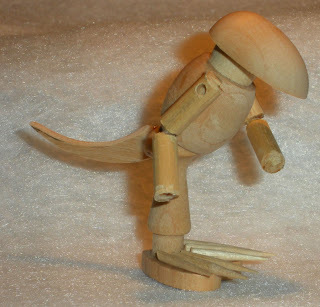 Purple - the legs and hips are a micro shaker peg. Pink - the base of the feet is a heart. I carved the tail out of a craft stick and the toes are toothpicks. As this is an experiment, I may end up removing the heart shape and simply glue the toes and shaker peg directly to the base. The figure below shows the size of the figure, in comparison with my 42mm figures that I normally make. I hope to finish a few more of these – enough to make a warband for playing a Shadowsea game – as I think these figures and this scale is perfect for skirmish gaming, rather than mass gaming I originally envisioned. I started experimenting with new shapes and I thought I would talk a little bit about them. 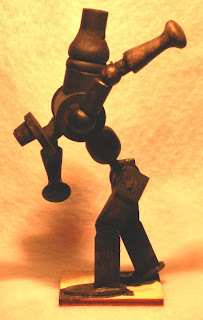 One of the areas where I have not been too happy is with the shape of the arms of some of my figures. 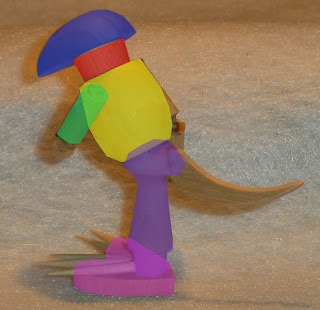 Using a flat craft stick, although it gives it a whimsical appearance, it creates a problem with some figures poses in that there is not a lot of surface area for adhesion and that the arms disappear when viewed from certain angles, must like flats or paper figures. In order to put some "meat on the bones", I started experimenting with what was essentially a scrap piece of wood that I threw into my bits box. The figure to the right is from my Stock of the Trade - Clothespins blog entry and shows the two types of clothespins I was using for various projects. Specifically, the areas in pink were being used for figure bodies, while the uncolored portions were essentially being cast into the woods bits box. 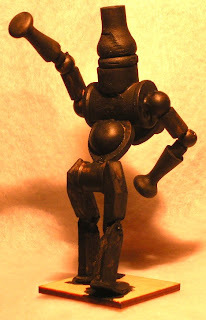 I had also used those pieces for the legs in my Steampunk Clockwork Soldier. In this experiment I show how to use those bits for arms on my 42mm soldiers. Below is a sample figure using the clips from the larger clothespin (MCP-400 in the American Woodcrafter's Supply catalog) as the arms. 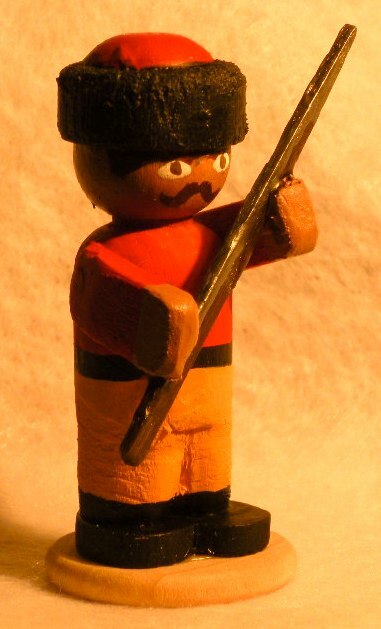 If you are wondering what the figure is, it is a Bokharan infantryman, circa 1866. (I bought the book 19th Century Central Asia and the Himalayan Kingdoms and thought the figure looked cool, so I decided to try and make one. I will be building other figures from this book in the future.) The figure itself is the standard Boy game piece with a Heart shape for the feet, and the clothespin clips for the arms. 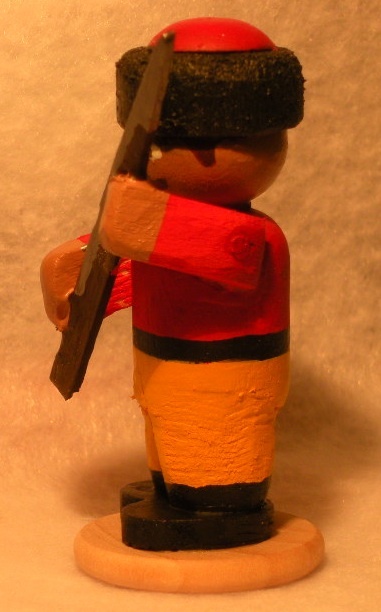 A standard flat toothpick acts as the rifle. 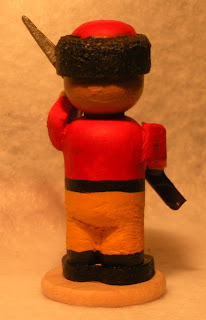 The fur hat was made by cutting the top off of the Boy, gluing a larger diameter dowel on top, then gluing the piece cut off of the top of the figure to the dowel. Overall I like the look of the new arms, even if it does increase the expense of the figure (now I have to buy clothespins in addition to all of the other pieces). At least I can use what was previously good scrap wood, however. One last experiment was carving the legs. All I did was remove some additional material between the legs at the ankles to give more of a trouser look. Although it takes more effort I like the look. I did a little more work on the Clockwork Steampunk Soldier, finishing off the arms and priming it black. Although the raised left arm looks a little 'unnatural' in how it is raised to crush an opponent, I am not too worried about it as I envision it swings with a spinning motion more mechanical and less 'organic'. Another figure using a new part – a flower pot – represents a Central Asian figure in a tall cap much like a floppy fez, but with a fur edge. I think it will look pretty convincing once it is painted and the 'fur' is roughed out. Finally, I am always looking at shapes and how to make new figures that can add some variety to those of the game pieces above. 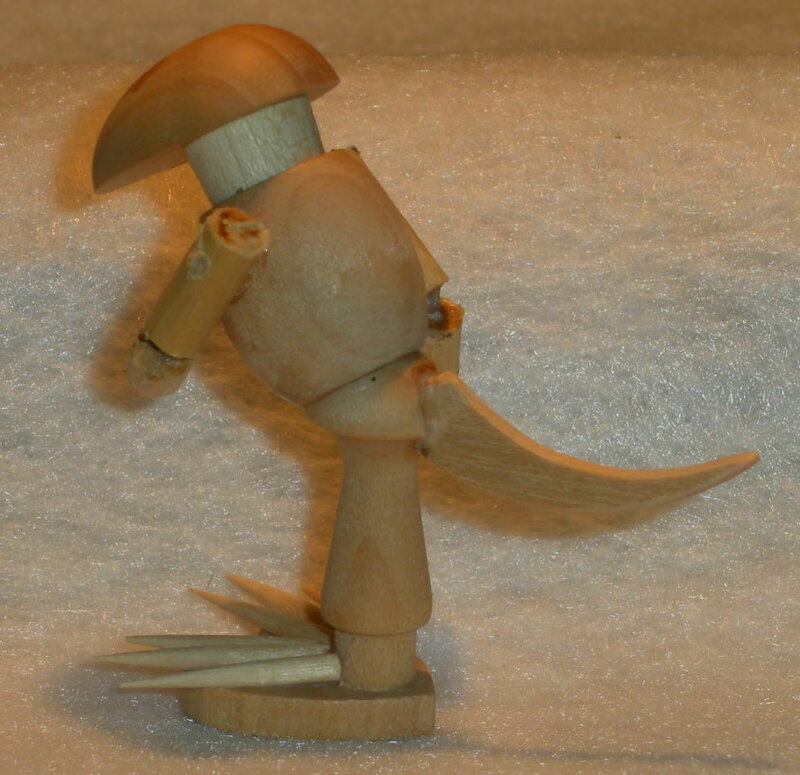 In this figure three wooden pieces are used: the doll head for the head, a 'barrel' bead for the body, and a spool for the legs and shoes. 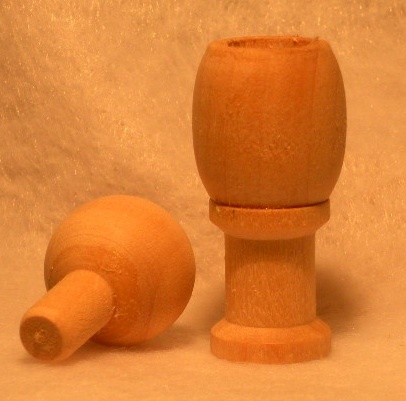 The only thing I don't like so far is the lack of a neck, so I would probably through a small piece of dowel between the doll head and the barrel bead.